Shasta Sitton, owner of Whitetail Press, LLC, is an ambitious woman who wouldn’t take no for an answer. She is my definition of a “mom on a mission”. She is a wife, a mother, a hunter, an author, and now a publishing company owner. 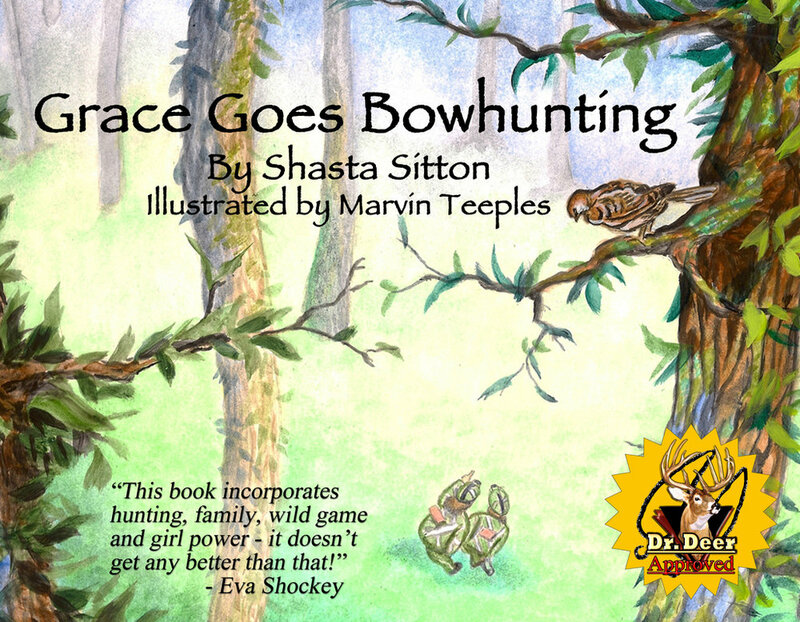 She has released three different children's books about hunting and fishing that have been heavily endorsed by the outdoor community, and isn’t planning on stopping there. What was your inspiration in writing children's books about the outdoors/hunting/fishing? When my son was just a few months old, I began wondering if there were any children’s books out there about hunting. I did a bit of research and found the selection to be incredibly disappointing. With all of the negative/false media and beliefs surrounding hunting, I was shocked that there wasn’t any children’s books out there to paint hunting in a more realistic/positive light. I was talking to my husband about it and he said, “Why don’t you just write one?” I laughed in his face, pretty hard actually. Afterall, I was a mental health therapist, not an author. Fast forward one year, a move across the country, and one huge career change later. Suddenly, this idea didn’t seem so far-fetched. My husband and I were now managing a private hunting and fishing club, and spending every day in the woods with our little son. I was no longer stressed beyond comprehension, and was able to contemplate what my book might look like. So I sat down and wrote a story about my son, Wyatt, going on his first whitetail hunt with his grandpa. I didn’t really expect anyone except my son to read it. Not long after, my father-in-law, who works with Dr. James Kroll from North American Whitetail, sent a copy of the manuscript to Dr. Kroll, and the both strongly encouraged me to pursue publishing it. No traditional publishing company would touch it since I was, *gasp* “teaching children to murder innocent animals,” so I started my own publishing company, and Whitetail Press was born. What books are currently offered? What are some of the life lessons kids will learn from your books? In “Wyatt’s First Whitetail,” and, “Grace Goes Bowhunting,” I really stressed the importance of ethical hunting practices, weapon (gun or bow) safety, and having respect for the animal you are hunting. I did my best to find a balance between educating the reader on hunting and also keeping them interested in the story. What’s the point of writing a book if the kiddo reading it finds it boring, right? I also end each book with the family sitting around the dinner table to eat the venison that was harvested. In “Grace and Wyatt’s Fishing Adventure,” my main goal was a bit different. I still taught the basics of fishing, but the main message that I wanted to convey was to get kids off of electronics and out into nature. Our kids are being consumed by electronics. Although I do realize that is the direction our society is going, I strongly believe that to be a well-rounded, healthy person, you need nature in your life on a daily basis. We owe it to our children to expose them to the different opportunities they can find outdoors. Whether it is fishing, hunting, hiking, catching butterflies; it doesn’t matter. Just get those kids outside. Why do you feel it’s important to introduce children to the outdoors/hunting/fishing? As I said before, there is so much inaccurate information about hunting out there. Hunters are being portrayed as evil, bloodthirsty, murderers. We kill animals just to see them die, and to have a trophy on the wall. Any true hunter knows this is ridiculous. However, by the time a child is old enough to go hunting, they have already been exposed to all of this garbage. Using literature at a young age to teach a child the positive side of hunting will get them interested, and hopefully keep their interest until they are able to hunt themselves. Anti-hunters are most definitely doing their best to stop hunting completely, and they’ll succeed if we don’t do our best to pass down our traditions to the next generation. This also applies to fishing and other outdoor activities. Although these activities are not as stigmatized as hunting, it is still important to expose children to as many options as you can. The more interest they have in spending time outside, the less they are going to sit inside and stare at a screen. What has been the most rewarding part of your journey selling children's books? Seeing and hearing about kids who love my books. Sadly, parents who read to their kids are getting fewer and far between. This is so disheartening because I remember how special it was to sit down with a loved one and a favorite book as a kid. So now, every time someone orders one of my books, I feel so honored knowing that my book will be a part of that special connection. I reinvest every penny I earn into printing more books and end up donating about half of them. I’m not a very good businesswoman I’m finding out. But I’m honestly ok with that. I didn’t write these books to get rich, I wrote them to get them in the hands of kids. Do you have any other books in the works you want to share about? You can find all three children's books on the website, www.whitetailpress.com, as well as Amazon and select stores throughout Michigan. See website for a complete list.